Looking for the best polymer handguns on the market? These aren't just "plastic guns" anymore. Polymer framed handguns deserve a place in the crowded pistol market, and we're going to sort through 10 of our favorite choices. Most of these are easy to track down, and available for a reasonable price for the most part. They could be found on the used market too, mainly because they've become so well known and popular. Polymer has a little more give and less weight, but completely switching from an all stainless steel gun to something so different can be a lot to ask for diehard firearm purists. The order is irrelevant, and really our opinion could change next week, but this is our idea of the top 10 polymer handguns you can buy. It's probably an unrealistic thought to imagine a better-selling polymer handgun, if you believe Glock's repeated claims of "5 million 17s built" since they started making the. Regardless, the Glock 17 in 9mm Luger sent people's minds for a spin when it first showed up in the 1980s. In many eyes the Glock 17 will forever hold the reign as king of the polymer pistols. Tons of militaries and law enforcement agencies across the globe will agree. The modular polymer XSeries grip on the P320 Compact from SIG has been vastly updated from its predecessors, and redesigned to stand up among the others on the list. The modular design makes it easy to understand and take down, and the customizable options are unprecedented. Trying to find an updated polymer pistol with looks and performance? Look no further than the Springfield Armory XD Mod. 2. The slimmed-down construction and three-zone textured handle makes for a fantastic feel in the shooter's hand. This is the carry pistol you've always needed. The CZ-USA P-10 fits all kinds of hand sizes, and has some of the most impressive magazine capacity ever (up to 21+1 with an extended base). The added weight helps with felt recoil, and it brings a new standard for semi-automatic pistols. It isn't gimmicky, either. The P-10 is well worth consideration if you're on a budget. If nothing else, the Heckler & Koch gets points for being the first to successfully market a polymer handgun. It set the stage, broke out of the norm, and shook things up before anyone else. The weight loss was the biggest draw, but those early versions were said to have pretty horrible stock triggers. Fast forward to today's HK offerings, and you get the superior VP9. It can spit rounds of 9mm with the best of them. Here's the Beretta APX, an aesthetically pleasing polymer gun with the performance to back up its appearance. The magazine capacity of the APX varies from 10 to 17, depending on what option you go with. As far as a home defense gun goes, you'd be hard pressed to find something better. A Smith & Wesson Bodyguard 380 should never be left off a list like this one. It's gained popularity for its reliability, short stature, and advanced light weight. The polymer frame helps a lot in that department, but doesn't sacrifice strength. It's meant to be a concealed carry gun, and it excels. The .380 ACP caliber is nothing to shrug at, either. It has a frame technically made of nylon-filled glass, but the properties are similar and it can be lumped in. The Ruger LCP II would make a great choice for anyone wanting a trustworthy gun that fits great in just about any holster. The LCP II doesn't have the capacity of some others on this list, but it is packed with safety features that you'll appreciate. The gun's crisp-breaking, single action trigger pull minimizes the risk of a pulled shot. 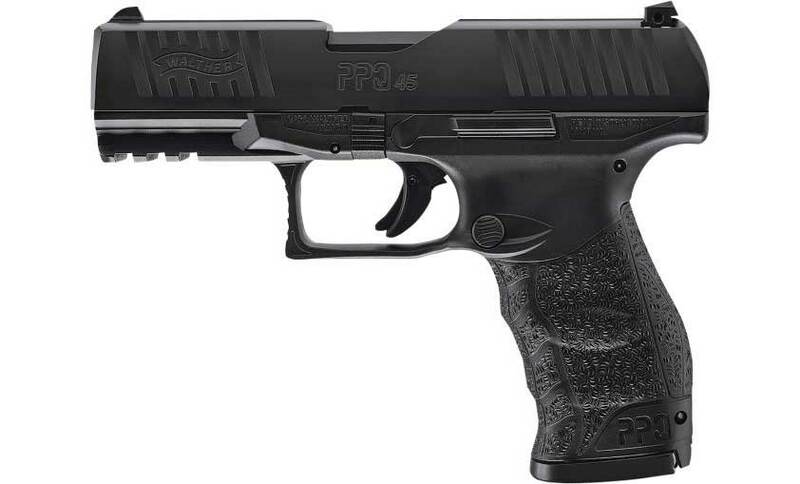 The Walther PPQ M2had to be featured in this list of polymer handguns, and there are plenty of legitimate reasons why. Self-defense guns don't always come with everything the PPQ has. Built for someone in need of a great carry handgun (not to mention law enforcement), the PPQ M2 could rank among the best of all 9mm pistols, not just the polymer-framed ones. The FNX from FN Herstal and its four-inch barrel makes for a handy full size polymer pistol, and ergonomics are instantly noticeable. The frame is checked and ribbed but won't get caught or snagged when your'e trying to holster it. FN prides themselves on making guns great for a lot of different kinds of shooters. The FNX family checks all the boxes.